Shopping for a new Kia Optima Hybrid? Unless you plan on springing for active safety, a Optima Hybrid Premium model is a compelling pick at just under $27,000. The 2018 Kia Optima Hybrid is a mid-size sedan with all the right moves. 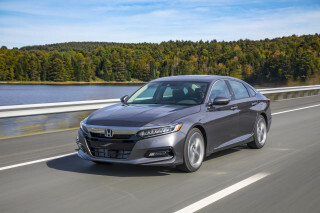 On top of its safe package (its crash-test scorecard is spotless) and relatively handsome looks, a fuel-efficient powertrain is subbed in for fewer trips to gas stations. The 2018 version doesn’t change at all from last year, which should be good news for shoppers. 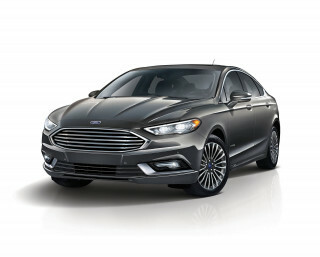 The base powertrain is a 2.0-liter inline-4 with a 1.62-kwh battery pack and electric motor. 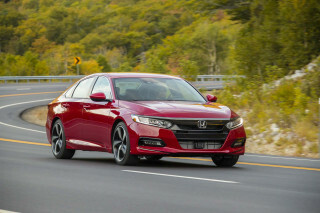 The combination manages a 39 mpg city, 46 highway, 42 combined rating by the EPA, which falls behind its main rival, the Toyota Camry hybrid, by 4 mpg combined. Those looking for more fuel efficiency may consider the Kia Optima Plug-in Hybrid, which mates the same 2.0-liter inline-4 to a 9.8-kwh battery and electric motor combo that can power the Optima PHEV on electrons alone for 27 miles. The combo has been rated by the EPA at 103 MPGe, or 40 mpg combined without a full charge. The Optima Hybrid borrows liberally from the Optima’s looks, which is a good thing. Only a few small badges give away its electrified powertrain, and its sleeker looks still turn heads on the road. Although not as daring as its predecessor, the Optima lineup (including the Optima Hybrid) focused more on interior refinement and ride quality that sheet-metal bravado. Inside, the Optima Hybrid is a subtle affair with a plain spoken interior that manages to be functional without being boring. Normally, we’d say the Optima’s ace is its ride quality and comfort, but the Optima Hybrid smothers rough roads even better. The 2018 Kia Optima Hybrid doesn’t stray far from the Optima sedan, which is a good thing. The 2018 Kia Optima Hybrid takes the Optima sedan’s good looks and doesn’t impart many cues to its greener propulsion system. The same sloped roof and curvy exterior sheet metal wrap a contemporary cabin. The look isn’t as revolutionary as it was in the beginning of the decade, but it’s still handsome. From the outside, the Optima Hybrid’s shapely hood, elongated dimensions, sloping roofline, and curves hint at a sportier mission. 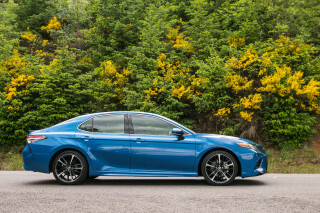 The Optima Hybrid and Optima are virtually identical from the outside, except for a couple badges on the front fenders and a grille unique to the hybrid models. Inside, the Optima Hybrid is comfortable and subdued, eschewing the last approach of a driver-centric cockpit for a more formal atmosphere. Style takes a backseat to substance in the Optima Hybrid, the dash materials and layout are secondary to the knobs, buttons, and controls that dominate the center stack. The infotainment system is inset into the dash with a textured plastic that seems like an afterthought to our eyes, but the rest of the Optima is fitted with appropriately soft and usable materials everywhere else. What it lacks in imagination, it makes up for in function—more than acceptable for a mid-size sedan. 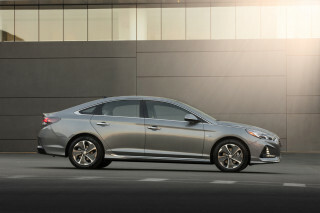 The Optima Hybrid manages its weight well with a smooth ride and enough power to move extra weight from its batteries. The Kia Optima Hybrid and Optima Plug-in Hybrid aren’t known for scorching performance, but that’s really not the point. Both cars pair a inline-4 to an electric motor and battery system with a 6-speed automatic and front-wheel drive. The Optima Hybrid manages a combined 192 horsepower, while the plug-in version manages 202 hp. Both Optima Hybrid and Optima Plug-in Hybrid models rely on a 2.0-liter inline-4 that makes 154 hp for long-range propulsion. The Hybrid’s battery packs can power the car for short distances on electric power only, but at low speeds and for short trips. 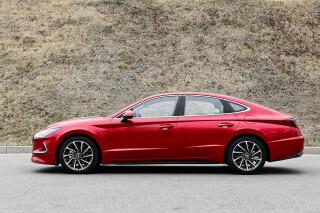 Like the Sonata Hybrid, the Optima Hybrid can toggle between Hybrid and Charging modes that can hold the battery’s state of charge or charge the 1.62-kwh lithium-polymer battery stuffed neatly into the trunk. The Optima Hybrid conveniently shuffles power between hybrid motors and engine without much fuss and we’ve noticed that the electric motor manages to smooth out shifts from the 6-speed automatic. The combined power output for the Optima Hybrid is 192 hp. 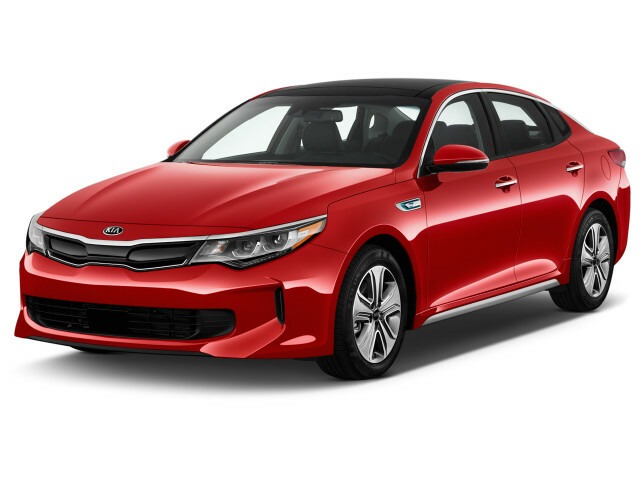 In Optima Plug-in Hybrid models, the battery’s size is significantly increased to 9.8-kwh and the electric motor is slightly more powerful for a combined power output of 202 hp. That bump in power is charged primarily with moving the heavier Optima Plug-in Hybrid, which weighs roughly 250 pounds more than the Optima Hybrid models. The plug-in hybrid version can travel on electric power alone for up to 27 miles, although it’s hard to lock in any “electric-only” mode—the internal combustion engine will kick on if the accelerator is mashed into the floor. 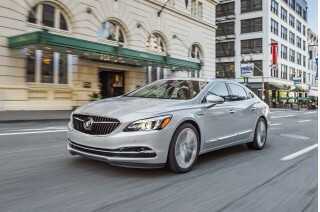 Like the Optima, the hybrid versions have a smooth and comfortable ride that should appeal to most mid-size sedan shoppers. The secret sauce, we think, is the revised bushings and cushier damping setup that smooths over rough pavement. The trade-off is a little more head-toss, which puts the Optima on par with its rivals. 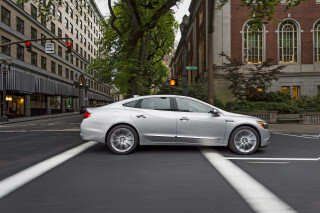 The Optima Hybrid succeeds in passenger comfort and interior quality. Like the Optima, the 2018 Kia Optima Hybrid uses upscale materials and a quiet ride to swing for the fences, automotively speaking. Hybrid and plug-in hybrid versions of the Kia Optima are offered in higher trim levels that pile on sound-deadening materials and luxury options that some base Optimas won’t have. The result is a quieter interior and power adjustable front seats that will adapt to most body types. The front seats are lower with deep bolsters that offer good side and leg support. The Optima’s sloping roofline cuts into rear head space, but wide door openings help taller passengers enter and exit without much fuss. There’s just enough head room for 6-footers, but taller passengers may want to consider calling shotgun—or taking the keys altogether. The hybrid batteries eat into usable cargo space, compared to the regular Optima. The Optima Hybrid offers 13.4 cubic feet of cargo room (compared to 15.9 cubes in the Optima) and the Optima Plug-in Hybrid offers 9.8 cubic feet of space, which isn’t all that capacious. Pricey optional active safety equipment keep the 2018 Kia Optima Hybrid from acing our test. The Optima is the type of car we point to when saying that bigger isn’t necessarily safer. The Optima aced its federal battery for 2018 with five stars in every crash test and it earned a five-star overall score. The IIHS called the 2018 model a Top Safety Pick+ thanks to its top “Good” scores on all crash tests, “Good” rating for its headlights, and “Superior” rating for front crash prevention. That front crash prevention is only available on Optima Hybrid EX models and Plug-in Hybrid models for $5,000 to $5,250 extra, including other optional features. That’s not ideal, especially considering that some automakers are making standard automatic emergency braking on some of their models. All Kia Optima Hybrid models have a standard complement of airbags that include dual-stage front airbags, seat-mounted side airbags, side curtain airbags, and a driver’s knee airbag. Every Optima Hybrid is decently equipped, but Kia bundles most of the options in a single, high-priced package. Kia offers the 2018 Optima Hybrid in Premium or EX trim levels with a considerable amount of standard features. The Optima Hybrid Premium trim includes cloth seats, keyless ignition, Bluetooth connectivity, leather-wrapped steering wheel and shift knob, cloth seats, 16-inch wheels, and a 7.0-inch touchscreen for infotainment. Optima Hybrid EX models add to base models 17-inch wheels, 8.0-inch touchscreen, a 10-speaker Harman Kardon audio system, leather upholstery, power-adjustable heated front seats, a heated steering wheel, and electronic parking brake. Plug-in hybrid models are only available in EX trims. Kia doesn’t offer many options above a costly tech package that adds active safety features for $5,000 or more. Ideally, we’d like to see that as standard equipment or available separately from other convenience features such as a panoramic sunroof or rear window shades. At more than 40 mpg combined, the Kia Optima Hybrid is a fuel-efficient pick among mid-sizers. The 2018 Kia Optima Hybrid succeeds in offering comfort and fuel-efficiency for a reasonable price. It’s not as efficient as the new Toyota Camry Hybrid, but among other mid-sizers, the Optima Hybrid fares favorably. 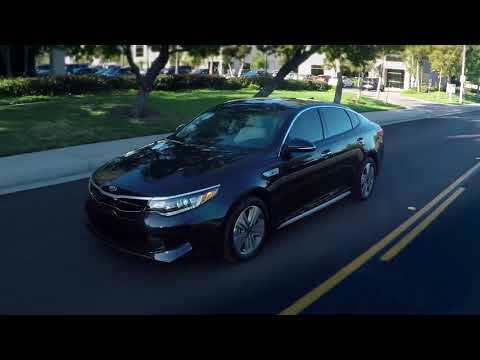 The Optima Plug-in Hybrid does even better. It manages 40 mpg combined without a full charge, but is rated at 103 MPGe when a fully charged battery is figured into the overall mileage. 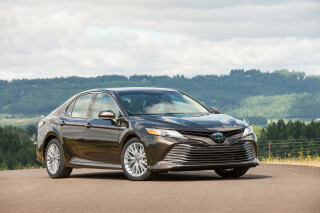 The Optima Hybrid's main competition, the 2018 Toyota Camry Hybrid, does better: it’s rated at 46 mpg combined (or 52 mpg combined in some trims), but costs roughly $3,000 more to start. Looking for a different year of the Kia Optima Hybrid?